In this section we offer you basic and accessible information on how to get to La Pedrera, its opening times and the rates for day visits. You will also find detailed information about the resources and services offered by Casa Mila in relation to physical, communicative and cognitive accessibility. 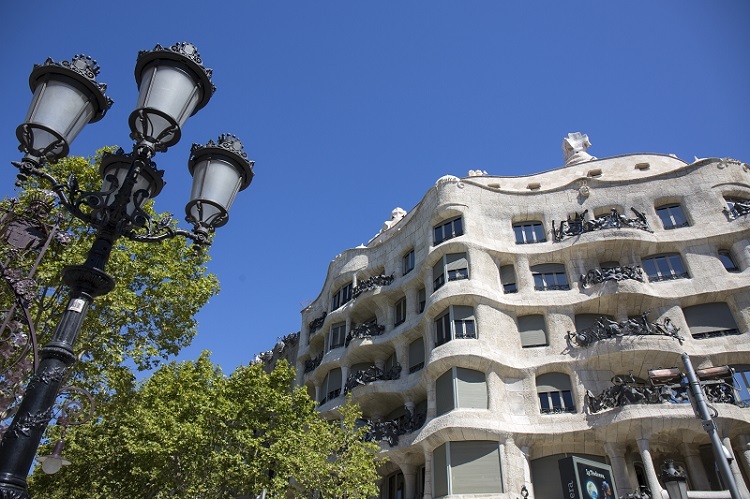 La Pedrera is located on Paseo de Gracia number 92, at the height of Provenza. From Plaça Catalunya it is just a metro stop. By car it takes 8 minutes and walking 15 minutes. La Pedrera opens every day, from Monday to Sunday, from 9 a.m. The closing time varies depending on the season, summer or winter. From March 1 to November 4 it closes at 8:30pm and from November 5 to February 28 it closes before, at 6:30pm. And there is a week that is closed for maintenance, that the year 2019 will be from January 7 to 13. The entrance to La Pedrera during the day has a general price of €22. Children under 7 have free admission and children between 7 and 12 have a reduced admission of €11. People over 65 also with a discount on admission, and the price of admission is €16.50. People with a disability of 33% or more can benefit from the reduced rate of €16.50. If the disability is equal to or exceeds 65% or the need for an accompanying person is confirmed, in this case, the person enters free of charge. Free access is given at the ticket office once the documentation accrediting the degree of disability is presented. Please note that there are many countries that do not specify the percentage of disability. In that case you only need to show the official letter that confirms the disability or illness. People with disabilities access to the building without queuing and through the main door of Passeig de Gràcia. The visit to La Pedrera by day includes a visit to the temporary exhibition. But you can also visit only the temporary exhibition, which offers reduced entrance for people with disabilities at a price of €4 per person. Casa Mila, known as La Pedrera, is a UNESCO World Heritage Site and also the last civil work of the architect Antoni Gaudi. A unique building, a masterpiece of nature where you can understand in depth the imaginary of Gaudi. La Pedrera is also the only interpretation center of Gaudi in Barcelona, essential to know all the work of the architect and his inspiration. In total you will visit 4,500 m2 spread over five floors. - The Roof and its spectacular skylights and chimneys. - Espai Gaudi, old laundry room located in the attic. - the Pedrera Apartment, which recreates the life of a Barcelona bourgeois family from the first third of the 20th century. - The Courtyards of Passeig de Gràcia and Provença. - and finally, the temporary exhibition hall, located on the main floor and former residence of the Mila family. The visit lasts approximately 1 hour and a half. For all the people with disabilities who want to visit Casa Mila but it is not easy to plan a specific day and time, there is no problem. You can come the day and time you want and inform our staff once you arrive to Casa Mila. They will give you priority access to buy tickets without queuing, access to the building without waiting and go in through the main door of Passeig de Gràcia. Everyone is welcome at Casa Mila. Catalunya La Pedrera Foundation recognises visitors’ diverse capacities and needs and offers a varied range of programmes and services to ensure that La Pedrera is accessible to everyone. Assistance dogs are welcome throughout the entire building. The tour of Casa Milà (La Pedrera) is accessible to people who use wheelchairs. There are lifts and ramps that connect the various floors. The courtyards, the Pedrera Apartment (Period Apartment) and the Espai Gaudí (situated in the Attic) can all be visited without difficulty. The Roof-terrace has many changes in level but is open to all visitors thanks to the lift and a platform next to the exit. There is an impressive sweeping view of the rooftop from this point. The exhibition rooms are reached by a lift from the entrance in the Passeig de Gràcia courtyard. Inside the rooms, there is a stairlift to take you to the reception lobby. The Laie book and gift shop is accessed via a ramp inside the building. The Auditorium and the Gaudí Room are easily accessible via a broad ramp. There are disabled toilet facilities on the ground floor, in the Pedrera Apartment (fourth floor) and in the exhibition rooms (main floor). The characteristics and forms of the building make it advisable for people with disabilities to visit it with a companion. Wheelchair users are accompanied by La Pedrera staff when using the adapted lifts. We have a wheelchair loan service to make it easier for people with reduced or limited mobility to visit the building. This service is subject to availability. Casa Milà (La Pedrera) offers a range of sensory resources intended to make it easier to understand the exhibits and to ensure access for all audiences. 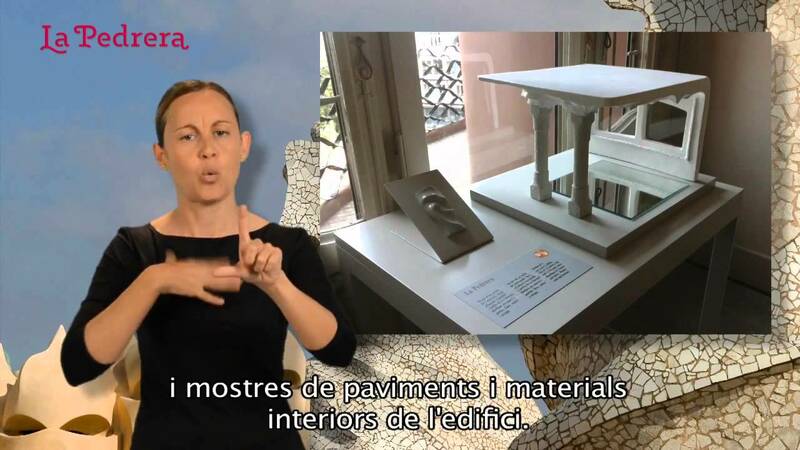 Thanks to the “Accessible La Pedrera” programme, increasing numbers of sensory resources have been introduced in the museum and gallery spaces and also in the contents of the programme of cultural events and activities. These include interpreting in Catalan Sign Language (LSC) and live subtitling (SPS) at various events, as well as audio descriptions of shows for audience members who are blind or partially sighted. In this way, the Catalunya La Pedrera Foundation works to achieve its goal of guaranteeing access for all to cultural material. • Audio guides: We have a range of different audio guides that are available in a number of languages to meet visitors’ needs. You can request them free of charge at the audio guide desk, next to the ticket office. For people with impaired vision, we have a descriptive audio guide. For people with impaired hearing able to lip read, we have audio guides transcribed into text. We also have individual magnetic neckloops for use with the audio guide device. • Tactile spaces: to make La Pedrera more accessible, we have situated tactile spaces along the entire route of the tour, including models of architectural and sculptural details of both the interior and exterior. There is a model of the whole building in the courtyard off Carrer Provença, where the tour begins, and models of particular features in the Pedrera Apartment (on the fourth floor). • Tactile plans: on every floor open to visitors, there is a visual and tactile plan that indicates the itinerary of the tour. These 3D plans have legends in three languages in ink, relief and Braille. They are to be found on the ground floor (Provença courtyard), on the Rooftop-terrace, in the Attic (Espai Gaudí) and on the fourth floor (the Pedrera Apartment). • For the blind and partially sighted: Leaflet in braille and in large print in a single document, tactile reproductions or images in high relief (depending on the exhibition) and guided tours. • For people with hearing aids that have a T setting: A portable induction loop system. You can request this at the temporary exhibition desk. • For people with impaired reading who use sign language or lip reading: Guided tours in sign language and lip reading. • Individual neckloops that can be requested from staff in the room. • Leaflets in braille at concerts. • Sign language interpreting service. The foundation has taken a further step to support groups of people with cognitive impairment and who need help to understand because of this. Many of the resources and services provided by the foundation are designed to improve the quality of life of people suffering from Alzheimer’s disease. In the temporary exhibitions at La Pedrera, we offer a range of cognitive stimulation visits and activities that encourage socialising with others and which stimulate the memory before, during and after a visit to the building. In partnership with neuropsychologists, who are familiar with these groups and their needs, we select pieces or themes likely to prove particularly attractive as a means to work on language, orientation, reminiscences, etc. These resources, created by the participants of the REMS program of the Foundation, are also made available to associations and carers or relatives of people with Alzheimer's, as well as foundations working in the field of cognitive decline that manage day centres and homes that run socialisation programmes to facilitate inclusion and the creative use of leisure time.